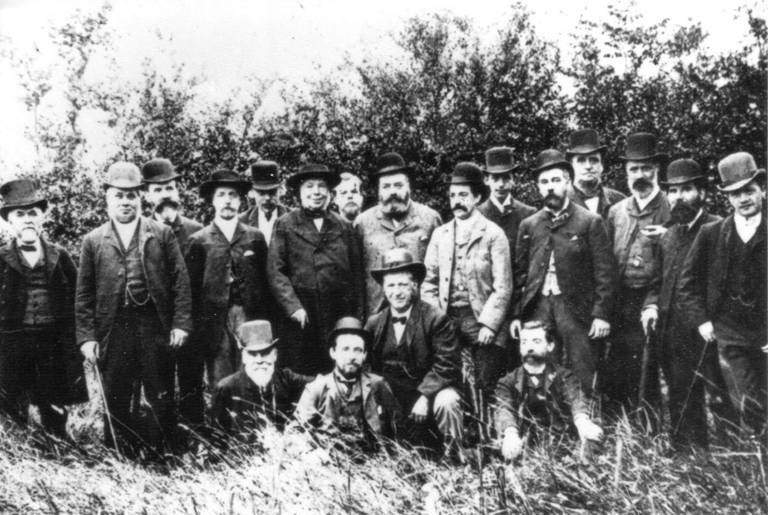 The Forest Ramblers’ Club was formed in November 1884 by a group of North-east London businessmen headed by Mr J H Porter, who became our first Secretary and Treasurer. One of the Club’s first aims was to keep a watch on Epping Forest. After 15 years of legal struggles against the lords of the manors, the Forest had in 1878 become a public open space under the management of the City of London Corporation and it was essential to make sure the Corporation were advised of any unlawful damage or encroachments. Because of the Club’s connexion with Epping Forest, the chief officer was – and still is – known as the Ranger, and there were up to 15 Verderers, each responsible for a particular area. This latter office is long since defunct. The Club soon began to explore footpaths on all sides of London, continuing to look out for any obstructions by landowners. Membership was limited to men, but the old ramble programmes shew that in the Club’s early years Ladies’ Days were held at frequent intervals, especially during the summer months. These often took the form of river trips or visits to places of interest, with transport by trap or brake included where appropriate. Evening social events also played an important part in the life of the Club in those early days. An annual soirée, consisting of an evening of music and dancing, was held from 1886 until about 1897, when dinners and social evenings found more favour. During this period there were also extended visits to places well beyond the Club’s usual area, such as Devon, Derbyshire, Cornwall, Paris and the Ardennes, and there seems to have been a considerable interest in natural history amongst members. Some notable personalities have been members of our Club in the past. These include the author of rambling booklets E S Taylor (alias “Walker Miles”), Sir Lawrence Chubb, Secretary of the Commons, Open Spaces & Footpaths Preservation Society (“Pathfinder” of the Star newspaper), Percy Lindley, author of travel books, and Charing Cross Road booksellers William and Gilbert Foyle. Rambles have been held continuously throughout the year since 1884, except during a few months in the Second World War when bombing was intensive. Only one walk is known to have been totally abandoned – at Cassiobury Park, Watford, on 12th February 1953, when the group was caught in a violent blizzard. During the 2001 foot and mouth crisis a complete substitute programme of walks, mainly in London, was arranged at short notice.